The decor here is very fancy, if slightly dated. The place is actually full, and there are a few people already waiting for a table. I'll just have to luxuriate on this couch while I wait for feed time. I wonder if they'll serve me feed if I'm lying down. I'm shown to a table. I switch sides of the table, and move my cutlery across. The waitress returns, and asks me if I'm left handed. I'm not, so she informs me that the knife goes on the right, and then switches my knife and fork. Also, my napkin appears to have come off my lap. She puts it back. 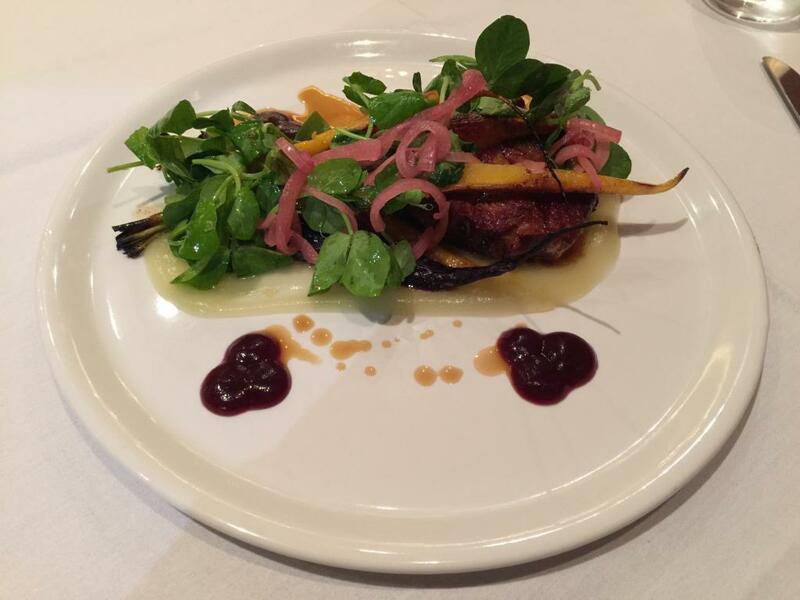 Red wine apple puree, roasted heirloom carrots and pickled Spanish onion. The pork is almost not like pork at all. It's juicy and fairly solid, and has a strong flavour, and minimal fat. The dollops of red wine apple purée are both sweet and tangy. It's such a simple combination, but one I've never seen before. There are slivers of pickled red onion amongst the carrots and rocket. They could be used to spice up the pork, but are better used to add a nice tang to the vegetables. Strawberries and balsamic ice cream. The waitress informs me that the shards of buttermilk have a sharp taste, so I should maybe get a little bit of the panna cotta, and a little bit of the ice cream on my spoon, and eat it together. This produces a kind of unknown composite dessert taste. 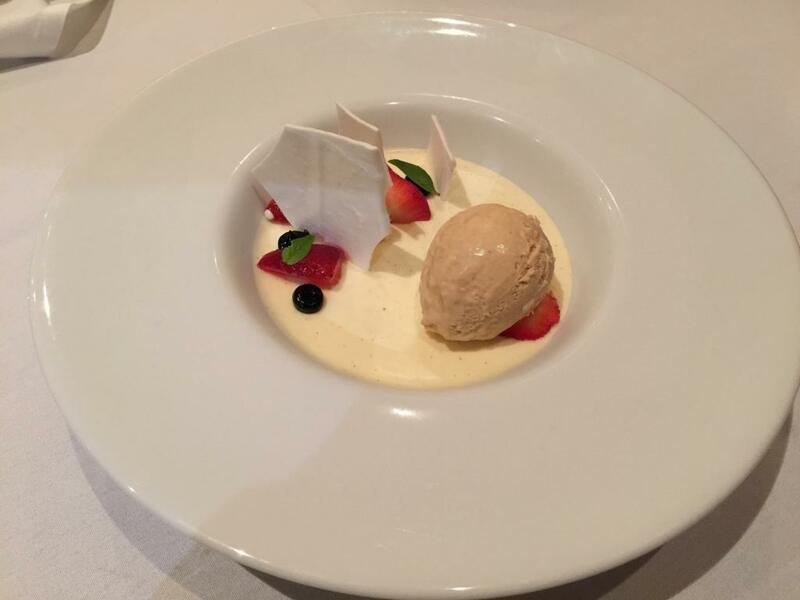 The buttermilk panna cotta is almost savoury, so it's only slightly sweet when eaten with the small amount of ice cream. The dollops of balsamic add a strong and interesting flavour. There's strawberry and little basil leaves here too. It's just too complicated. Every spoon has to carefully measure out these six components.